Let it never be said that Ron Howard, or whoever runs his social media accounts, doesn't know how to pique Star Wars fans curiosity. It remains to be seen if he can make a quality Star Wars movie out of the untitled Han Solo spin-off, but all of his posts from the set are making this a must-see for fans of a galaxy far, far away, if for no other reason than to figure out what many of them amount to. His latest tease is no different, as it contains a very obscure Star Wars Easter egg that could mean big things for the standalone. Ron Howard took to Twitter to provide us with this latest image from the set of the Han Solo movie. The image features some alien writing on sand-colored stone that may look familiar to Star Wars fans. We'll get into that in a second. But the biggest clue, and biggest contribution to the mystery, comes from the caption provided with the photo. Here's what the director had to say about it. "Can anybody translate for me? #McQuarrie #UntitledHanSoloMovie"
Now, what could this photo possibly be teasing? First and foremost, this is clearly something that is being pulled from the legendary concept artist Ralph McQuarrie. That much is clear, but beyond that, all we can do is speculate, since it seems that nobody has managed to actually translate the markings yet. The first thing that comes to mind is Jabba the Hutt. Not only does this look vaguely like something seen in Star Wars: Return of the Jedi, but it also mirrors McQuarrie's original drawings of Jabba's palace. There are also similar markings in the Temple of Lothal, which will be familiar to fans of Star Wars Rebels. Does that mean we could be seeing some crossover between the animated series and the live-action movie world? 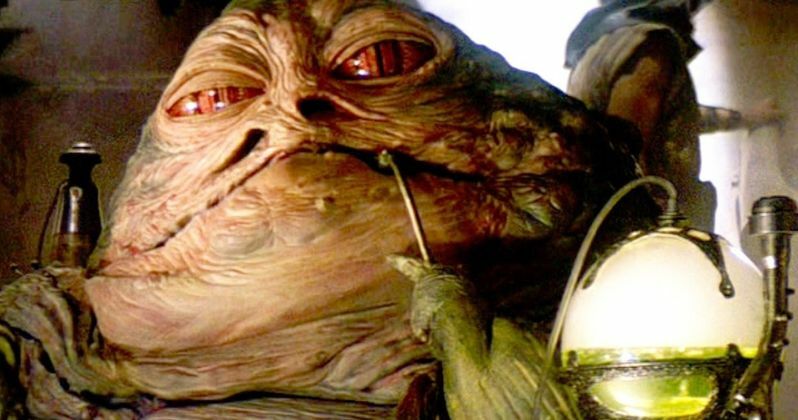 Maybe, but the more likely tease is to Jabba the Hutt. For one, Han and Jabba have extensive history, so his inclusion in the Han Solo movie makes a ton of sense. Not only that, but previous reports have indicated that the crime lord will appear in the movie. What we know for sure is that this will take inspiration from Ralph McQuarrie, which is something of a staple for the Disney era of Star Wars thus far. One of the most shining examples of this is Darth Vader's castle on Mustafar from Rogue One. Phil Lord and Chris Miller certainly weren't doing much to tease the Han Solo movie before they were fired. Maybe Ron Howard is just doing it for damage control purposes? Either way, this is maybe one of his most intriguing posts yet. We'll have to wait until the untitled Han Solo movie hits theaters on May 25, 2018, to know for sure what it means. Or at the very least when the first trailer finally arrives online.